Motorcraft 7700 VV is a variable venturi carb, and is a very unusual carb. Very little good is said about it and few know how to work on them - which is probably why they were so disliked. This chart begins on Page 1343, which is Page 9 of Section 93A. Use this chart to find the calibration code or codes for your application. Calibration Parts List: The parts lists start on Page 1 of Section 93B, which is Page 1383 of the catalog. Search for "CALIBRATION PARTS LIST NO. X" where X is the parts list number for the carb in question. That gives you numbers to every part that is specific to that calibration code. In the case of the carb, get the carb #, such as E0TE-ACA for CC #1. And, get the Component Parts List No., which is 95.1E in the case of E0TE-ACA. Carburetor Identification Chart: Section 9510, which is page 1859, is the start of the Carburetor Identification Chart, which cross references the Identification #, such as E0TE-ACA, to the Parts List 95 number, the carburetor's part #, the gasket set #, and the tuneup kit #. Section 95.1, which starts on Page 1888, gives the details about the carb. 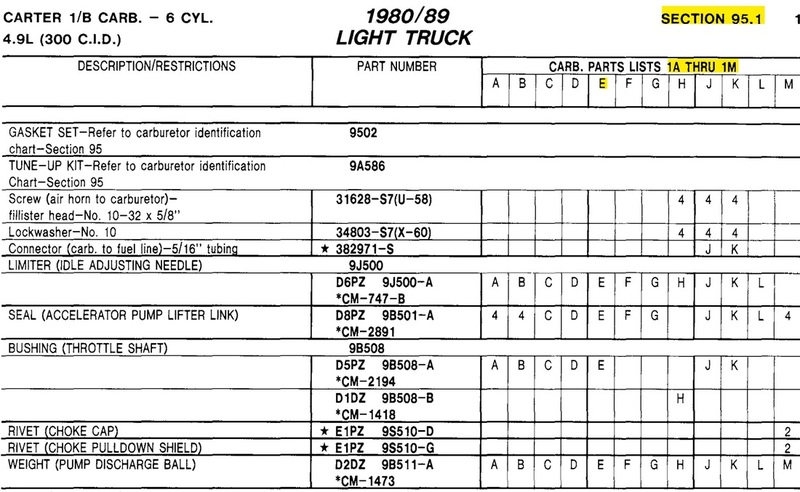 Use the "Parts List 95" number and find the pages that relate to your #. In the case of the E0TE-ACA carb the # is 1E, and in the example below you can see that I've highlighted that this page relates to CARB. PARTS LISTS 1A THRU 1M, which includes 1E. And, I've highlighted the "E" column, so you can scroll down and find all the details, meaning anything that has an entry in Column E.